Late treys, Collier rally Lady Blue Devils past No. 3 JCCC 69-64 – Welcome to Wyandotte Daily! 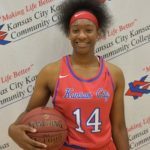 Kansas City Kansas Community College’s Lady Blue Devils couldn’t buy a 3-point field goal the first 36 minutes Monday night, then knocked down three in a row to rally to a 69-64 win over No. 3 ranked Johnson County. 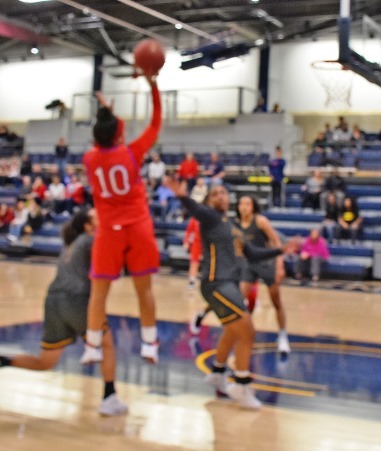 Billed as a battle of Jayhawk Conference heavyweights, it was all that – nine ties and 15 lead changes before sophomore Nija Collier and freshman Brodi Byrd provided the knockout blows. Boyd drew the Blue Devils even 57-57 with a trey with 3:35 left, Collier put KCKCC ahead to stay 60-59 with a three at 2:21, Caitlyn Stewart knocked down a critical baseline jumper for a 62-59 edge with 1:43 to go before Byrd delivered a dagger 3-pointer for a 65-59 lead with 1:08 remaining. Two Stewart free throws widened the KCKCC lead to 67-59 with 25 seconds left and Lenaejha Evans wrapped it up with two charity tosses in the final three seconds. The win over a JCCC team that had been ranked No. 1 in the nation most of the season tightened KCKCC’s hold on the Jayhawk Conference lead. At 5-1, the Blue Devils (23-3) lead Highland and Labette (both 4-2) by one game and the Cavaliers (3-3) by two games with four to go. KCKCC is right back in action Wednesday, playing host to Hesston while Highland and Labette are colliding in Parsons. Collier, the 6-0 sophomore from Detroit, led the Blue Devils with an All-American performance – 25 points, 14 rebounds, four assists and three blocks. All were game highs and came when the Blue Devils needed them most – 19 points and 12 rebounds in the second half. “We had no answer to No. 14 (Collier),” said JCCC coach Ben Conrad, whose Cavaliers suffered only their third loss (23-3). One of the top 3-point shooters in the conference, Collier missed her first six threes before draining the one that put the Blue Devils ahead to stay. “Coach (assistant Tameka O’Neal) told me to keep shooting; it’s going to go down. I like to take the big shots; my teammates push me to take big shots,” she said. Lenaejha Evans was the only other Blue Devil in double figures with 12 points including two treys while Stewart had eight points, six rebounds and three steals in guiding the offense for 36 minutes. “Biggest win in my two years,” Stewart said. Byrd contributed the two big 3-pointers while Lillie Moore and Kisi Young got the Blue Devils off to a 14-point lead in the first half with six and five points. KCKCC surged to a 28-14 lead with 7:19 left in the half only to turn ice cold, getting only baskets from Moore and Young in a 12½ minute span in which JCCC outscored the Blue Devils 24-4 and led 38-32 before Evans finally ended the drought with 5:05 left in the third quarter. That’s when Collier took over, scoring 15 points and grabbing 12 rebounds in the final 15 minutes. Neither team shot well, KCKCC 25-of-69 for 36.2 percent; JCCC 24-of-72 for 33.3 percent. The Blue Devils had a 40-37 rebound edge; JCCC fewer turnovers 13-11. K.K. Jackson-Morris had 21 points and 10 rebounds to lead JCCC. KCKCC will take a four-game winning streak into Wednesday’s game against Hesston – wins over Fort Scott which was ranked No. 13 early in the season, No. 10 Highland, No. 16 Labette and No. 3 JCCC. “I bet no other team has played a tougher stretch than that and to win all four makes me very proud of this team,” McKinstry said. The Blue Devils play at Fort Scott Saturday and Highland next Wednesday before a season-ending home re-match with JCCC Saturday, Feb. 23.